Our great tasting energy bar is perfect as a healthy meal before or after training, or as a meal on the go. It is naturally vegan, GMO free and only contains natural sugars. 1 box contains 4 energy bars, á 40g. Our great tasting energy bar is perfect as a healthy meal before or after training, or as a meal on the go. Packed with almonds, dates and a handful of super-seeds like chia, quinoa, pumpkin, sesame topped off with fibre from inulin for maximum effect. The ingredients are chosen by healthconscious people from the ecofriendliest farms we could find. 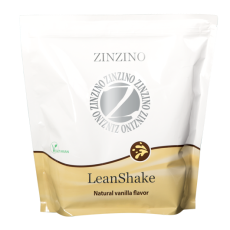 It is naturally vegan, GMO free and only contains natural sugars. HIGH IN ENERGY - fast and long lasting fuel. HIGH IN FIBRE1 - 10g of beneficial fibers doing good for your body. NO ADDED SUGAR - get energy without sugar cravings. VEGAN - for everybody to enjoy. GMO & PESTICIDE FREE - rest assured we used the best ingredients. WADA FRIENDLY - athletes can safely enjoy the bars, being free from forbidden ingredients. Almonds is a highly nutritional nut and a rich source of vitamin E, manganese and magnesium. Almonds are a source of copper, phosphorus, niacin, fibers and antioxidants. Compared to all other nuts, they are richer in nutrients and beneficial components healthful mono- and polyunsaturated fats and antioxidants. Almonds contain natural occurring sugars. Dates are a good source of iron, fiber, vitamin A and potassium. Essential minerals such as calcium, phosphorus, sodium, magnesium, and zinc can be found making them one of the healthiest foods in the world. Dates have high levels of soluble fiber, which is essential in promoting healthy bowel movements and comfortable passage of food through the intestinal tract. Dates have natural occurring sugars like glucose, fructose, and sucrose. Therefore, they are the perfect snack for an immediate burst of energy. Pumpkin seeds contain a wide variety of antioxidant phytonutrients, including some phenolic acids and polyphenols like the lignans. Pumpkin seeds also contain health-supportive phytosterols. Pumpkin seeds are a very good source of zink, iron, phosphorus, magnesium, manganese and copper and the World Health Organization recommends their consumption as a good way of obtaining these nutrients. In addition, pumpkin seeds are a great source of dietary fiber, protein and the essential fatty acids omega-3 and omega-6. Sesame seeds have health benefits due to their nutritional content, including vitamins, minerals, natural oils, and organic compounds which consist of calcium, iron, magnesium, phosphorus, manganese, copper, zinc, fiber, thiamin, vitamin B6, folate, protein, and tryptophan. Dried whole sesame seeds are composed of 23% carbohydrates, including 12% dietary fiber, 50% fat, and 18% protein. Quinoa is high in protein and one of the few plant foods that contain all nine essential amino acids, and for this reason it is an excellent source of protein. It has both more and better protein than most grains. It is also high in fiber, magnesium, B-vitamins, iron, potassium, calcium, phosphorus, vitamin E and flavonoids which are plant antioxidants. Chia seeds are nutrient-dense and pack a punch of energy-boosting power and have become one of the most popular superfoods in the health community. The reason chia seeds are so beneficial is due to them being rich in fiber, omega-3 fats, protein, vitamins A, B, E and D and minerals including Sulphur, iron, iodine, magnesium, manganese, niacin and thiamine; and they’re a rich source of antioxidants. Inulin is a soluble dietary fiber found in many plants but most often extracted from chicory. The naturally occurring polysaccharide/fructan is however not processed and thus inulin has minimal impact on blood sugar rise. It increases calcium absorption and possibly magnesium absorption, while promoting the growth of beneficial gut bacteria in the colon. 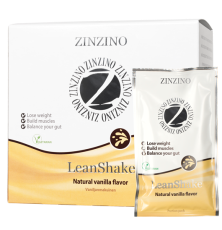 Zinzino Energy Bar contains 10,4 g of dietary fibre, which is more than 42 % of the recommended daily intake for adults. Dietary fibre promotes beneficial effects for your gut, cholesterol, and satiety. There is no added sugar to the energy bar. However, all fruits and nuts have a natural content of sugar. Since the sugar is encased in fibre it has a positive effect on the metabolism in our bodies. The fibre helps to slow down the sugar absorption which prevents the sugar from direct access to the liver. 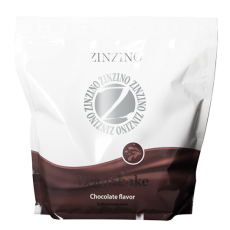 Therefore, Zinzino Energy Bar contains the perfect ingredients for an immediate burst of energy. 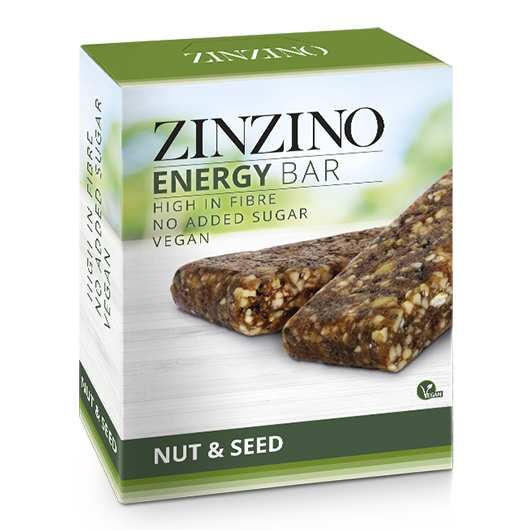 All ingredients in Zinzino Energy Bar are from vegan certified sources and can thus be enjoyed by all vegans, vegetarians and everyone else who craves for energy and a great tasting energy bar. 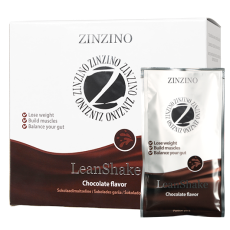 Zinzino Energy Bar does not contain GMO based soy and/or maize derived ingredients and/or GMO based food additives or flavors. 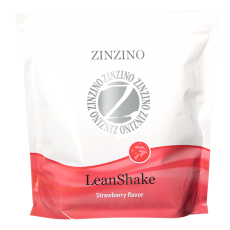 Zinzino Energy Bar in its whole or in part, does not contain nor has come into contact with any product/s, which is banned by the IOC and or WADA. Zinzino Energy Bar is certified for not containing any heavy metals and complies with the EU legislation 1881/2006/EC. 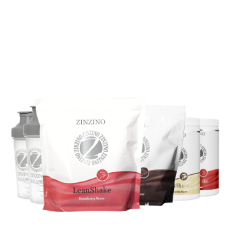 Zinzino Energy Bar is certified not to contain any trace or left-over pesticides and complies with the EU regulations 396/2005/EC. 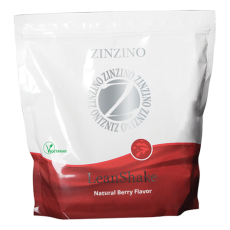 Zinzino Energy Bar is certified to be free of nanoparticles. Zinzino Energy Bar contains no cereals containing any gluten (wheat, rye, barley, oats, spelt, kamut) and products thereof. 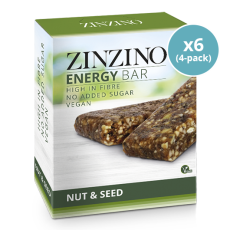 Zinzino Energy Bar is sold in a box containing 4 bars à 40 grams. Each bar is packed individually in wrapping foil. Peanuts and products thereof. Contains natural sugars. Store in a dry place at 15 - 22°C and away from direct sunlight. Almonds 25,5 %, dates 20 %, isomalto-oligosaccharide* 14 %, pumpkin seeds 8,2 %, sesame seeds 6,1 %, quinoa flakes 6,1 %, humectant (glycerol) 7 %, inulin 5 %, chia seeds (salvia hispanica) 5 %, olive oil 4 %. *isomalto-oligosaccharide is a source of glucose but has a low glycemic index of only 34.